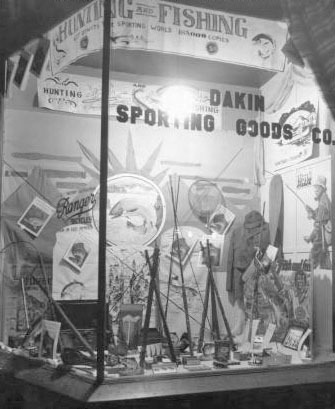 Dakin's as it appeared in 1937. The store has since closed. FBI “Identification Orders,” square cards with a suspect’s photo, finger fingerprints and description (variations of which are still used today) were sent to police departments across the country, as well as roller skating rinks because of Brady’s fondness for the sport. 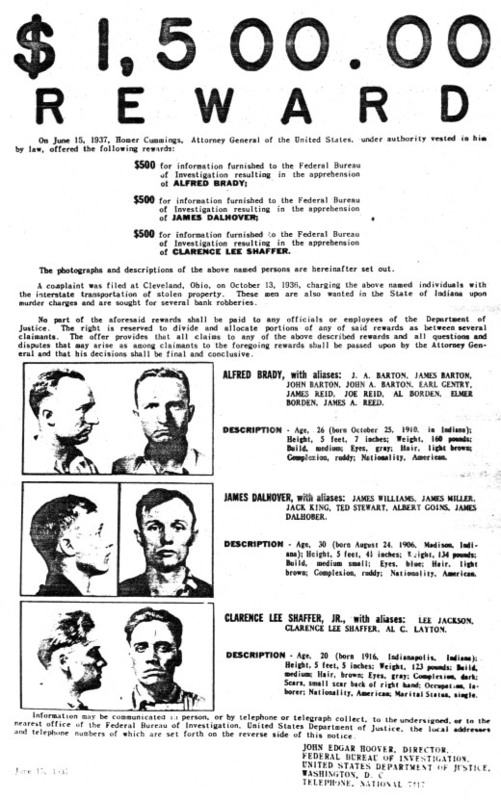 On June 15, U.S. Attorney General Homer Cummings offered a $1,500 reward for information leading to the trio’s arrest. Thousands of circulars with their photos on them were distributed to banks, service stations and businesses. Police were placed on high alert and the FBI questioned anymore with even the slightest connection to the trio. As the search intensified, the gang returned to Baltimore for clothes and weapons and then drove to Buffalo, N.Y., where they remained in a rooming house for about a week before heading first to Nashville, Tenn., and then to Milwaukee, Wis. Now desperately in need of money, they hit The Peoples Exchange Bank of Thorp, Wis., on Aug. 23 for approximately $7,000 and another revolver from a bank guard. The following day they returned to Buffalo where they remained until Sept. 3 when they left for Bridgeport, Conn.
Dalhover later told the FBI that on Sept. 21 they left Bridgeport for Bangor, Maine, where they purchased two .45s and ammunition at Dakin's Sporting Goods Store on Central Street, and three .32 automatics at another, Rice & Miller on Broad Street, before returning to Bridgeport. He said he was against going to Bangor, but was out voted by the other two. He said Brady believed Maine to be an easy place to procure large amounts of guns and ammunition without suspicion because of the extensive hunting in the area. At Dakin's, however, they drew the attention of clerk Lewis Clark who later notified owner Everett S. “Shep” Hurd. Brady had asked for 500 rounds of .30-caliber ammunition, paid for it in large bills from a large roll of money, and then asked about extra clips and if certain high-powered weapons with special extended clips were available. Clark said they trio didn't look or act like hunters, nor did they talk like they were from the area. Suspicions was confirmed on Oct. 5 when the gang returned and purchased a third .45 and ordered several extra clips. They also asked about purchasing machine guns and other items and when Hurd said he didn't stock them, he was asked to order them and they said they'd return Oct. 11 or 12 to pick up the items. After the gang left, police were called, as well as Sgt. F. R. Hall of the Maine State Police. Hall called Wilbur H. Twole in Augusta, chief of the state police, who then called the FBI field office in Boston which immediately dispatched an agent to Bangor. When Hurd and employees identified Dalhover’s photo as one of the men who came to the store on Sept. 21 and Oct. 5, the agent contacted the FBI office in Washington and the special squad tracking the gang was sent to Bangor. On Oct. 11, Hurd received a telephone and he identified the caller as one of the trio. The caller said they'd come in the morning to pick up the guns and other items ordered. A surveillance of the store was established and an agent posed as a clerk while another was placed in the back of the store. Other agents posed as customers while still others were placed in a building across the street. Many were armed with machine guns. The stage was set.